The term 'moderation' is usually (in web applications) applied only to discussion forums and refers to the managing of topics, posts and polls, and managing the community in general (Composr also uses the term for chatroom and Wiki+ moderation, but these are not discussed in this tutorial). This tutorial will explain what is possible in Composr, although these features are all very easy to find and use. 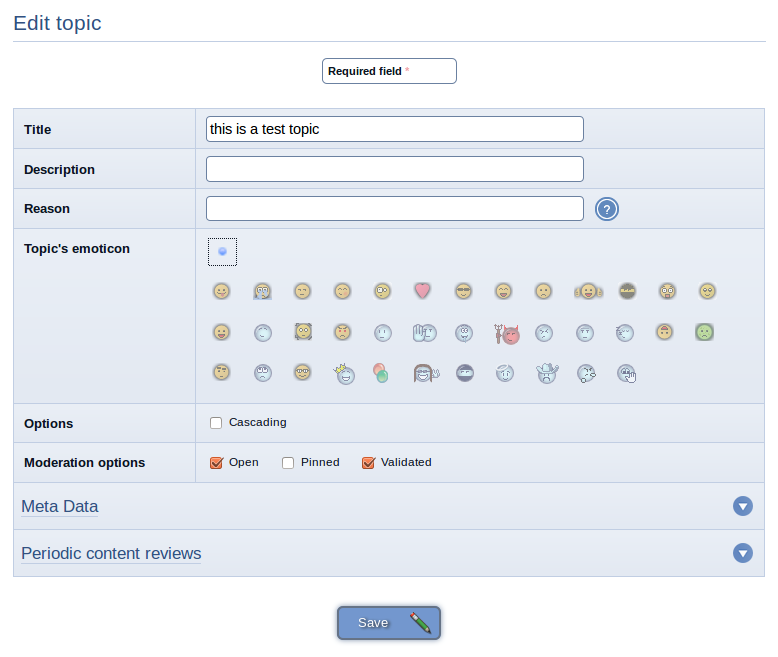 Topics may be individually moderated from inside the topic, or mass moderated from the forum-view, by using the 'mark topic' feature in conjunction with the 'topic actions' drop-down list. All these actions are very straight-forward. Posts may be individually moderated, or mass moderated. Both these actions are done from inside the topic where the posts reside. The "split posts from" feature moves posts out of the current topic and into a new one. The "merge posts into" feature moves posts out of the current topic and into an existing one. When moving to a new topic, the title of the topic is as of the first moved post. If the first moved post has no title the topic will be given an arbitrary title (which you may later edit). The 'post history' feature allows you to view text of all revisions a post has gone through, and restore deleted posts. It is also possible to delete post history. The 'post history' feature was designed so you can track moderations, including moderations done by actual posters (in case they are trying to cover something up). 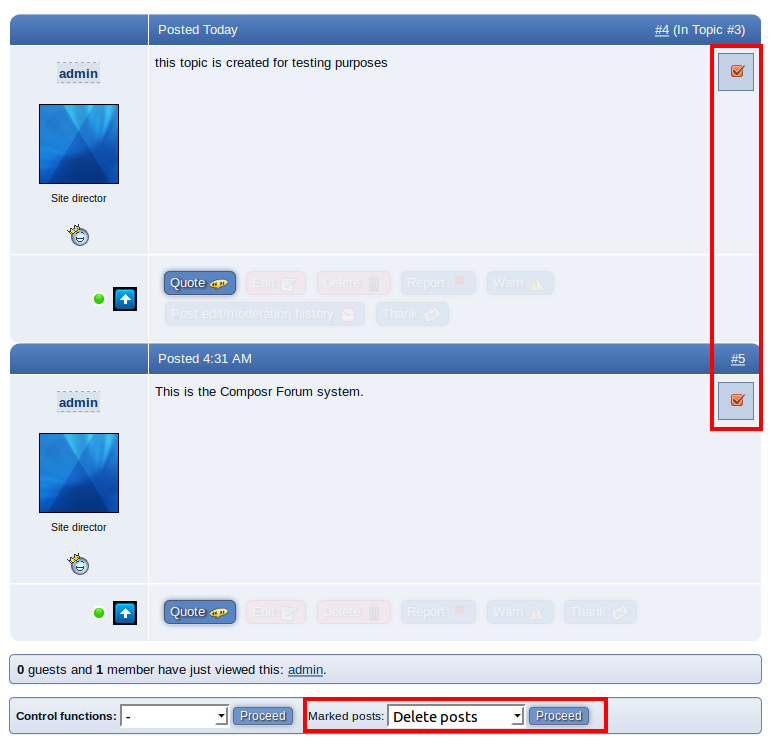 To access this feature navigate to the forumview module (Social > Forums on the default menus). Go into one of the listed forums. To add a topic, press the 'Add topic' button and provide the title and post for the topic, then press the "Add topic" button at the bottom of the form. To add replies to the a topic quickly type some out via the Quick Reply box, pressing the "Make Post" button to submit each post. Whether members may moderate their own posts and topics depends on their privileges. The forum permissions are set in exactly the same way as other permissions in Composr are. Without the necessary permissions members will not be able to make topics and posts without them being initially marked as validated. 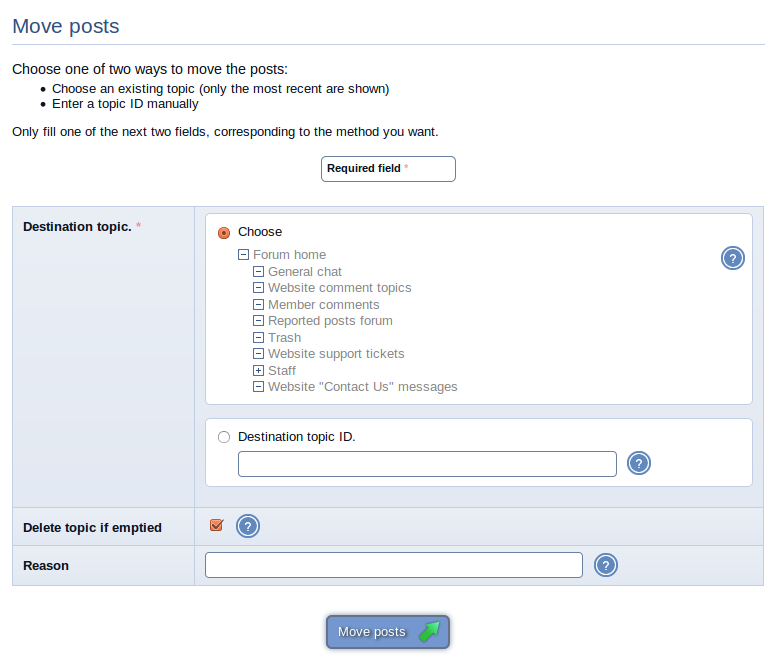 If you have chosen to configure your forum like this then you will need to check all non-validated topics and posts for suitability of content, and choose to validate or delete them depending on this. More information about forum validation is presented in the Discussion forums tutorial. 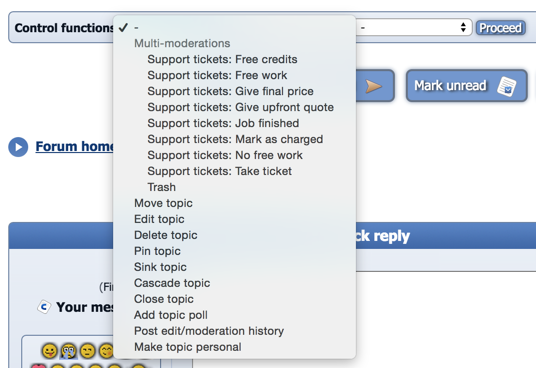 Multi-moderation is a very useful feature for moderating busy forums. Multi-moderations allow you to define 'canned responses' which can be stamped on a topic at the touch of a button: these responses can include text as well as topic modification actions. For example, a multi-moderation could be set to allow a developer to automatically mark a bug-report as fixed with a 'Thank you, confirmed' message, that closes the topic. Fill out all the fields on the form as required. Try to make the post sound as professional as possible (if the multi-moderation is for making a formal response). Admin Zone > Structure > Forums > Multi-moderations > Edit multi-moderation. You can delete a multi-moderation from the bottom of its edit form. To use a multi-moderation, you need to browse to an appropriate topic. Select an appropriate multi-moderation from the 'Topic actions' drop-down list, and click the 'Proceed' button to apply the multi-moderation to the topic. Note that Composr comes with several predefined multi-moderations that are present from when you install Composr. 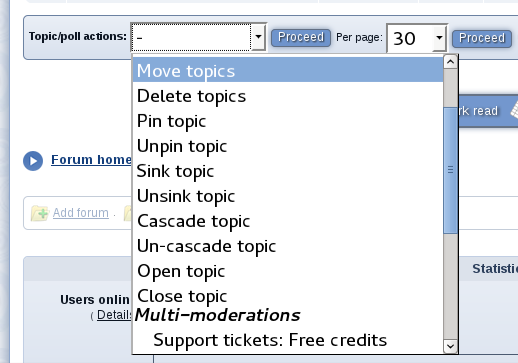 You may also use multi-moderations from the forum view screen, by selecting topics you want to multi-moderate and using a multi-moderation from the 'Topic actions' drop-down list.